There are two male pioneer settlers in the Bay of Quinte area (Charles Saylor and Henry Chambers Saylor) and many people get confused about the lineages. Both were born in NJ and their relationship is unknown at this time. I want to thank Peter Johnson for his insight and expertise in helping to separate these two family lines. A male descendant would be very welcome in the Saylor DNA Project to see if there is a match with descendants of Charles Saylor who have already been tested. See the DNA section below for details. To the right is loose page from a family Bible recording the children of Henry Chambers Saylor and his wife Phoebe White. Source: Possession of Randy Saylor. Back in the 1980's, Peter Johnson, well known Loyalist expert and friend, had Saylor ancestors with names that I did not recognize. It took a few years but eventually we discovered that there were three Saylor pioneers who settled in the Quinte area. Two of them, Charles Saylor and his sister Lavina, settled near Bloomfield, Prince Edward County. The third, and new discovery, was Henry Chambers Saylor who settled on Lot 4, Con 1, Sidney Township purchasing the lot in 1821 from his father-in-law, Reuben White. Charles (1786), Lavina (1790) and Henry Chambers (1795) were all born in New Jersey and this makes one wonder if they are connected. Henry Chambers Saylor, listed variously as a carriage maker, waggonmaker, wheelwright and also as a yeoman, married Phoebe White, daughter of Reuben White, sometime before their first child in 1821 One of the daughters, Esther Saylor, married George Emery Meyers and she is the mother of my grandmother. Coincidentally I descend from both Charles Saylor, from whom I get my surname, and Henry Chambers Saylor on a maternal side. Peter Johnson descends from Caroline Saylor, another daughter of Henry C. and Phoebe Saylor. In a family Bible in my possession there is loose page torn from another Bible listing the children and birth dates of the children of this couple (picture above). This is the only known record of their birth dates. Henry C Saylor was not a loyalist, he never petitioned for land and would be considered a settler. How or why he came to Upper Canada is not known. He is not mentioned in Pioneer Life on the Bay of Quinte. 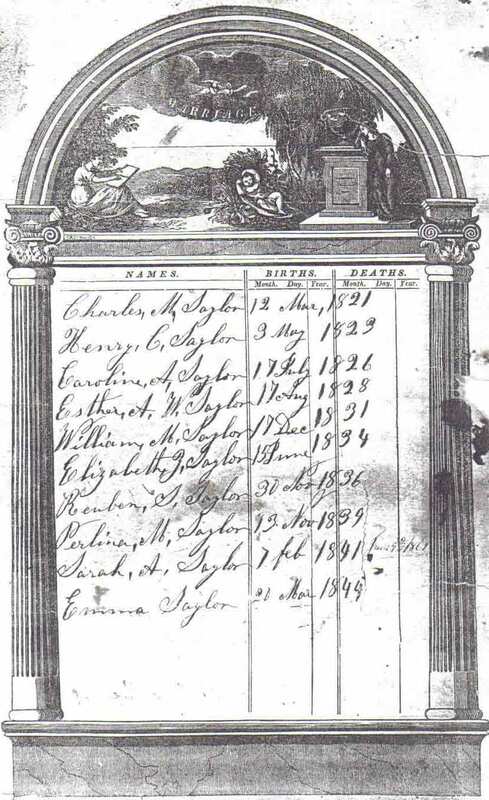 The earliest record of him in Upper Canada, found so far, is the January 1819 militia list shown below. At that time he is shown as residing on Lot 13, Con 1 in Sidney and in 1821 he buys 10 acres on Lot 4 where he and Phoebe spend their adult life together. In 1815, Reuben White bought the whole of Lot 13 and in 1819 Henry C Saylor and a number of other young men, named on the militia list, are living on the lot. Perhaps they were tenants. The fact that Henry married Phoebe, Reuben's daughter, connects this picture. It is not known when or where Henry C Saylor died. He is not recorded as buried in White's Cemetery. Considerable effort has been made to find his burial location but no cemetery record or stone or obituary has been found. It is possible he was buried beside his wife but that the marker was lost, made of wood or maybe never even made. He was mentioned in Phoebe's 1866 will and so is assumed to have outlived her and thus died after 1866. Perhaps one of his children moved away and he lived his last years with them away from the area. Peter Johnson reports that there are statements on the internet that he died 7 Feb 1872 but no citations are recorded. This is questionable since he is not found in the 1871 census under Saylor, Taylor and Faylor and the equivalents. 1. HENRY CHAMBERS SAYLOR was born Abt. 1795 in New Jersey.1. He married PHOEBE WHITE Abt. 1819, daughter of REUBEN WHITE and ESTHER MARSH. She was born May 1803, and died February 07, 1867 in Sidney Twsp, Hastings Co. Ont..
2. i. CHARLES MALLORY2 SAYLOR, b. 12 March 1821, Sidney Tp. ; d. 1881.
ii. HENRY CHAMPLAIN SAYLOR, b. 3 May 1823; m. SARAH HUTCHINSON, 30 April 1864, Kingston, ON. 3. iii. CAROLINE ADELIA SAYLOR, b. 17 July 1826, Sidney Twsp, Hastings Co. Ont. ; d. 10 April 1890, Sidney Twsp, Hastings Co. Ont..
4. iv. ESTHER ANN W. SAYLOR, b. 17 August 1828, Sidney Twp., Hastings Co., ON; d. 21 December 1880, Sidney Twp., Hastings Co., ON. 5. v. WILLIAM MERRELL SAYLOR, b. 17 December 1831.
vi. ELIZABETH Z SAYLOR, b. 15 June 1834; m. MATTHEW MILLS, 29 September 1864, Sidney Twsp. ; b. Abt. 1833.
vii. REUBEN S SAYLOR, b. 30 November 1836.
viii. PERLINA MARGARET SAYLOR, b. 13 November 1839; m. ALBERT E LOBB. ix. SARAH ANN SAYLOR, b. 7 February 1841; d. 9 June 1861, Whites Cemetery, Row 8.
x. EMMA SAYLOR, b. 20 March 1844; m. THOMAS D WELLER; b. April 1845; d. 6 March 1868. See my World Connect Family File for descendants. 1851 census he is 56 and born in the US. Thus he was born about 1795. Given that he was 23 years old on the Jan 18, 1819 it is probably safe to assume his birth year is 1795. Henry purchased part of lot 4 from his wife's maternal grandfather, Mathias Marsh, on Jan. 4, 1821, 10.5 acres, Lot. 4, Broken Front Conc. 1, Sidney. It was registered June 5, 1832. "Between Mathias Marsh Esquire, Township of Sidney ... Henry C. Saylor, wheelwright of the said township"
On 8 June 1831 Leonard Soper of Hope Tp., Newcastle District, yeoman, sells to Henry C Saylor, Sidney, wheelwright for 175 pounds, Lot 4, Conc 4, Sidney. Witnesses Reuben White, Sidney, ESQ, and James W Barber, Hope, schoolmaster. Reg 19 Nov 1833. Henry sold land to his father-in-law, Reuben White, stating his full name as Henry Chambers Saylor; Lot 4, Conc. 1, Feb. 13, 1835. "Henry Chambers Saylor, wheelwright of the township of Sidney ... Reuben White of the same township"
SOURCE: AO, GS 4272, No. 52. SOURCE: William Bell Papers, AO, M-211, 1549-50, 1556-7. Henry signed these two petitions in support of various causes. Click on the link to see the transcriptions. In 1830, signed HC Sayler as one of over 100 inhabitants of Sidney petitioning for a school in 1830. In 1836, signed as HC Sailor as one of 59 inhabitants of Sidney petitioning about a lot at the mouth of the River Trent. Perlina, 14; Sarah, 11; Emily, 8. A torn page from a Bible contains the birth dates of the children of Henry and Phoebe White. It is the only known source of this information. It is in the possession of Randy Saylor. Saylor, Henry, waggonmaker, 1st concession, broken front, lot 4. Source: Directory of the County of Hastings, 1864-65, p. 335, possession of WRS. In the name of God Amen. I Phoebe Saylor of the township of Sidney county of Hastings and Province of Canada being in sound mind and understanding do trully will and bequeath all my property both real and personal as follows vis. 1. To my well beloved husband Henry Chambers Saylor I will and bequeath part of the lot No. 4 broken front of Sidney containing by admeasurement - Ten acres and Two rods more or less for the term of his natural life. I also will him the sum of Fifty dollars per year of my part of proceeds of a mortgage given to Samson Hogle to me Phoebe Saylor the term of his natural life. 2. To my children Champlain Saylor, Caroline Adelia Saylor, Esther Ann Saylor, William Merrell Saylor, Elizabeth Saylor, Paulina Margaret Saylor, and Emma Saylor I give and bequeath all my property real and personal in equal slices each with each, but to my daughters Paulina and Emma I give and bequeath one half of my household furniture to be equally divided between them and the remaining Half of my Household furniture to be equally divided between my daughters Caroline, Esther and Elizabeth said division of my property of household goods not to take place till after my husbands death. I also will and bequeath that should my daughter Paulina die unmarried and prior to my death her share shall be equally divided amoung my surviving daughters share and share alike and ???? amount of Paulinas share shall be coming her from the Executors of my estate shall be divided amoung my surviving daughters share and share alike at her death. 3. I also will and bequeath to my son Charles Mallory the sum of One dollar of lawful money of the Province of Canada. I also will that my Executors George Emery Meyers, John Ross and John Burris Blair shall have full power and control over the shares of my children Champlain and Paulina that they shall pay these shares as they may see they need it, and otherwise use it for their benefit and ???? amount of balance of Champlains share that shall be in the Executors hands at his death shall be equally divided between my son William and my surviving daughters. I appoint as my Executor with full power to act in the ???? George Emery Meyers, Yeoman, Sidney, John Ross, Yeoman, Sidney and John Burris Blair, Carpenter formerly of Trenton give under my hand and seal this my last will and Testament on the ninth day of August one thousand eight hundred and sixty six at Lot No. 4 Broken front of Sidney. Signed sealed and delivered in our presence this ninth day of August 1866. Signed George E Meyers, Caroline A Blair, Peter Begg, Phoebe Saylor. Is Henry Chambers Saylor related to Charles Saylor of Bloomfield? Henry was born abt 1795 in NJ and Charles was born in 1786 in NJ as well. They both settled in the general area about the same time. The Saylor line in the Pioneer Life of the Bay of Quinte is the Charles line from Bloomfield. These two lines have caused difficulty for those trying to identify the Saylor lineage. There is no evidence to show that these two pioneers are related. If a Saylor male descendant of Henry Saylor had his Y-DNA done it could be compared with the known Y-DNA profile of Charles Saylor. Y-DNA tests have been done for two paternal descendants of Charles Saylor, youngest son of Samuel Sayler. The results are posted on the Saylor DNA project web site. Take note of these two tests on the above web site. Test 110884 and 154198 match 36/37 and indicate a very recent paternal common ancestor. Both men who were tested are 5 generations from Charles Saylor so we can say conclusively that the common ancestor is Charles Saylor. It can also be said that their results identify the Y-DNA of Samuel Sayler, the father of Charles Saylor. Note that these compare closely with other Saylor tests (groups 3 and 4) a few of whom know they came from Binninngen or Bottmingen, Switzerland. Both of these are today suburbs of Basel, Switzerland. Given these close results it can also be concluded that the Saylor ancestors of Charles Saylor came from in and around Basel, Switzerland. It would be wonderful if a male descendant of Henry Chambers Saylor would come forward and be tested.